During an SEO audit, we decided to update the permalinks in our blog to include the blog slug. This apparently lets the Google know that the content lives in the blog section of the site and doesn’t compete as much with actual top-level pages. Previously, we have all our blog posts set to show as top level urls. Working again on setting up the htaccess redirects for the brown bag site. Which was just matching with the slash. We tried some regex combinations, but that didn’t seem to work. So, I ended up reading the manual and rediscovered RedirectMatch. For more complex matching using regular expressions, see the RedirectMatch directive. So now our blog urls are more SEO friendly and the old incoming links will safely arrive at their destination. And we have 100 redirect rules (the minimum we could since there are no other match rules that would work with our top level post urls that wouldn’t also match every/any other page of the site) to show for it, rather than 200. 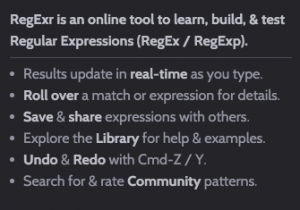 Side note: I also found a good tool too (regexr.com), it’s more useful than my previous regex goto (regex101.com). It does a better job at teaching the innards of the expressions. It’s also nice how you can save your regex for later, see ours: http://regexr.com/3bvtf.